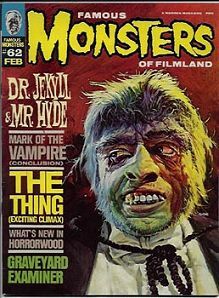 February 1970 issue of FM with "Dr. Jekyll & Mr. Hyde" cover and feature. Also the conclusion of the "Mark of the Vampire" two-part film book. Near-mint condition. The cover has a nice painting of Fredric March in the role of Mr. Hyde. March was the only actor to ever win a Best Actor Oscar for a monster role. He tended to chew the scenery a bit, but he did do a good job as Mr. Hyde. It's almost like two different actors were playing the part. Website design and hosting by Sohodojo Business Services. Item 157 of 466 items displayed in viewer. 0 items in cart.